Eremo is a Switzerland-based web site on the subject of the hermit life, edited and maintained by Brother Markus. The dominant tradition is Hinduism, but Brother Markus includes Buddhist and Christian mystics as resources in his articles on various aspects of eremitism, and in his recommended readings. The Hindu term “Brahmacharya” is emblematic, defined as “a lifestyle adopted to enable one to attain the Ultimate Reality.” And that lifestyle is the lifestyle of the hermit, supplemented by the practice of virtue, meditation, yoga, and careful readings of classic sages. The site is in German, with English and Spanish translations of the site as options. Supplemented by photos of Brother Markus’ hermitage and environs. The Swiss town of Solothurn, maintaining the Verena Hermitage, has hired a new hermit after the departure of the previous hermit in February 2016, who complained of too much social interaction with visitors to the historic site. The new hermit is Michael Daum, a 55-year old German ex-policeman who studied theology and meditation after leaving law enforcement. Because the hermitage has proved a sightseer magnet, the local community had asked for a “sociable” hermit to fill the position. This followed the resignation of the previous occupant, Verena Dubacher, who, after five years in the job, withdrew in 2014 on the grounds that too many visitors had damaged her health. Sister Benedikta, a divorced mother of four children who took religious orders in 2011, had declared herself as ready for the rigours of the unusual posting when she beat off 118 other applicants in the summer of 2014. But she now has been forced to step down after being treated as an object of curiosity. “I never had a problem with the number of people who came for spiritual advice or pastoral care,” she told the 20 Minuten newspaper. But other visitors were just nosy, and wanted to see what a hermit was like or to have a chat. “It simply became too much for me,” she said. UPDATE: A hermit-caretaker has been hired! An article in WorldCrunch highlights the dilemma of the owners of the St. Varena Hermitage in the Swiss city of Solothurn. The owners want to hire a hermit, but one who is sociable enough to greet visitors, arrange for marriages and social uses of the churches on the grounds, and generally promote the site. The owner, representing a property management firm, does not want to alter the job description. The previous hermit lasted 5 years before resigning to seek a place more hospitable to a hermit. The apparently simple form of Zumthor’s building proves to be far richer than it first appears. The concrete has been poured by Herr Scheidtweiler, family and friends, over a wigwam-like timber frame. Once the concrete had set, this frame was set on fire, creating walls inside the chapel that are strangely blackened and haunted with the ghosts of the timbers that once supported them. The floor is a frozen pool of molten lead, while the roof is open to the sky and, by night, the field of stars above. Rain and sunlight tumble and fall through this oculus to create atmospheric patterns of shade and glistening weather. Zumthor’s chapel is numinously dark inside, but when you look up, the oculus itself resembles the flare of a star – a reference, presumably, to Brother Klaus’s vision in the womb. 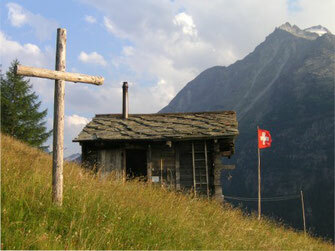 Being here alone is close to feeling, if not understanding, the faith that sustained the Swiss hermit. So, here is a building containing just one room, with a roof that fails to keep out the rain, made of rough concrete, burned timber and lead. It has no electricity. No running water. No plumbing. No lavatories. No wind turbine. No solar panels. No air-con. No pictures hang on its walls. It offers no obvious, or accepted, sense of comfort. And yet it is compelling and very beautiful, offering solace.